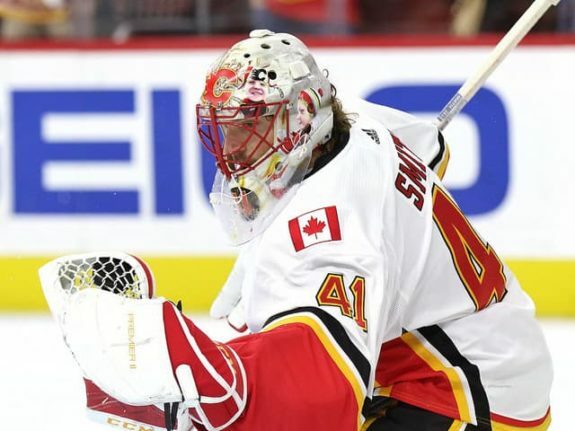 Calgary Flames goalie Mike Smith may have lost the faith of the team’s fans, but the stats say he could be their only hope for a long playoff run. 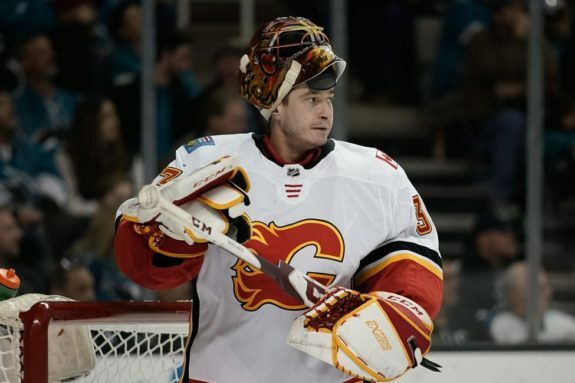 Much like the Pacific Division-rival San Jose Sharks, goaltending is the Flames’ biggest question mark. 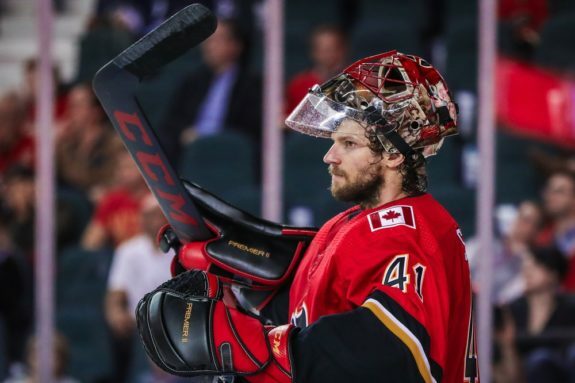 As the Flames are the first Western Conference team to clinch a playoff berth it may be reading a bit too much into a hypothetical problem that isn’t all that much of one in the grand scheme of things. However, having allowed 2.81 goals per game, the Flames rank sixth of the eight Western Conference squads headed to the postseason. Admittedly, a big reason for that Achilles heel has been Smith’s play so far. His .896 save percentage ranks at No. 49 among goalies who have played 21 games. Considering the fact there are 31 teams in the NHL and that same number of No. 1 goalies for all intents and purposes, the clear-cut argument would be Smith has been deservedly riding the pine, backing up David Rittich. I mean, it’s hard to deny the logic there. The saying goes that you dance with the one that brought you. And Rittich’s 25-7-5 record is right up there among the best in the league. It’s his own save percentage, which sits at an admittedly decent .910, that is relative cause for concern. Since early January, Rittich hasn’t been nearly as effective as he was earlier on, when he helped the Flames salvage the season as Smith struggled. In Rittich’s last 15 starts, he’s got a save percentage of just .891. Compared to Smith, who has a save percentage of .905 over the same 15-game span, it’s effectively a tale of two seasons. Granted, Smith’s numbers far from instill confidence, but you’ve still got to go with the goalie who’s playing better, right? The argument maybe then becomes, well, the Flames win more playing in front of Rittich. Regardless of how well he’s been performing, the team must have confidence in him, at least more confidence than they do in Smith. Case closed. Right? Well, no. Since the Flames also have a winning record under Smith (19-14-2). And, over those same 15 games, Smith is 8-6-1. Rittich is just 9-3-2. The discrepancy isn’t that great, especially if you go back further for a larger sample size. Since late November, in 23 games, Smith is 14-7-1. In Rittich’s last 23 contests, he’s 14-4-4, which would equate to the same won-loss record in the playoffs. You could argue Rittich has the longer track record looking at their overall records this season, but, over their careers, as recently as last season, Smith was still an above-average goalie. In his career, he’s far more proven than the 26-year-old Ritich, who has played just 63 games. Smith also has a Western Conference Final appearance under his belt. Is Smith a No. 1 Goalie? There’s undeniably a worthwhile debate to be had as to whether or not Smith was ever worth the big contract he signed with the Coyotes. Hell, there’s a debate to be had as to whether he’s actually a No. 1 goalie, as, statistically, he’s had only one season when he was legitimately elite, in 2011-12 with the then-Phoenix Coyotes. But you can make the same argument about Rittich, minus the one elite season, because he hasn’t had one yet. And Smith was also on some piss-poor Coyotes teams, making the playoffs just the one time in six seasons. Of course, he’s only had two playoff appearances overall, so it maybe depends on how much you value experience in net. If, on the other hand, you’re not a big believer in intangibles and feel the Flames need to go with the hotter hand, well… that would still be Smith, remember? Even if “hotter” is relative, because both are about as on fire as an electrical candleholder. It’s all smoke and mirrors, with head coach Bill Peters requiring a solution that prevents his team’s season from going up in the former prematurely. The Flames are undeniably a good team overall with Stanley Cup aspirations. Their trade deadline could have gone better, according to most reports, with regard to the Jason Zucker trade that wasn’t. Whether or not the Flames were also in on one of the few goalies available is irrelevant at this point. 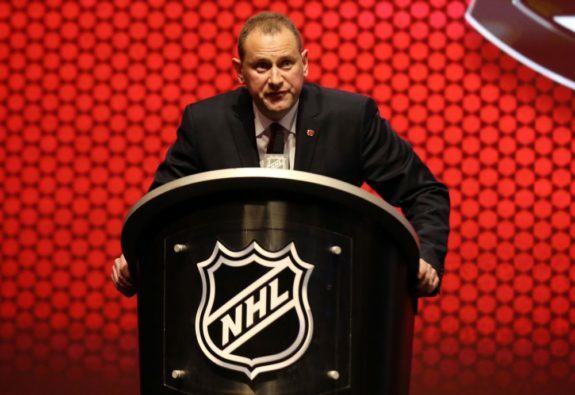 For the record, general manager Brad Treliving did say heading in that the Flames have confidence in their goaltending and Rittich specifically. That’s undeniably the right thing to say, but, seeing as both goalies have been playing about the same amount of games down the stretch, it’s hard to believe the Flames aren’t the least bit concerned, trying to get one of their goalies on a roll as the playoffs start. On the plus side, the worst-case scenario for the Flames is probably the status quo. In that case they would continue scoring at will en route to a regular-season conference title and a first-round matchup against those same Coyotes. In such an instance, there should be little doubt: You’ve got to go with Smith and hope the motivation to beat his former team helps him to further exorcise his demons. It’s not that Smith deserves the benefit of the doubt. He doesn’t, based on his season up to this point, maybe even his career. He deserves a shot though, as much as Rittich does anyway. And, as alluded to earlier, there are no ties come the playoffs. Peters has to pick one goalie off the bat. The Flames traded for Smith for a reason. This is it. Subscribe to Our FREE Flames Newsletter! We'll drop only our Calgary Flames stories into your Inbox a few times a week.